Champion jockey A P McCoy rode through marked pain to record his 30th win at The Festival when Taquin Du Seuil won the JLT Novices' Steeplechase. McCoy, who slid gingerly from the Jonjo O'Neill-trained winner when dismounting, and then took lame steps towards the weighing room, put his injury into context when saying: "I'm sore, but not as sore as Bryan Cooper," who suffered a broken leg yesterday. Both riders took independent falls in the Fred Winter Juvenile Novices' Hurdle, McCoy when brought down on Goodwood Mirage. McCoy's mount started at 7/1 and won by three -quarters of a length from the J P McManus-owned Uxizandre, trained by Alan King. The jockey said: "I was very sore last night and was struggling earlier today, but I'm very pleased to ride this winner for Jonjo, and disappointed to have beaten my boss [McManus]. He very kindly let me off to ride this fellow because we thought he had a very good chance. "Jonjo is a great man to ride for and is the sort of fellow who brings horses here in great form. He gets them to perform this week. 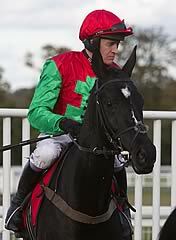 "He [Taquin De Seuil] is tough and has lots of experience. He had a bit of luck on the way round because other horses fell around him. Yesterday every horse that fell I seemed to run into the back of, whereas today I had a bit of luck. I knew he might idle in front so I was mindful of that, but he battled well. "He coped well with the ground." Of his Ladbrokes World Hurdle ride on At Fishers Cross, McCoy said: "Hopefully he has a good chance, but I could easily have picked the wrong one [he could have ridden More Of That]. I still think Big Buck's is going to be very hard to beat." Trainer Jonjo O'Neill hopes that Taquin Du Seuil could be a future Betfred Cheltenham Gold Cup contender after the seven-year-old's victory. 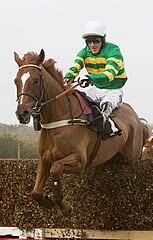 A P McCoy rode the winner, beating Uxizandre, carrying the colours of the rider's boss, J P Mc Manus. "The horses are running well and they are in great form coming here. I am very happy with the way things are going but it was nice to get that one because I do like this horse. I think he is a really good horse and a horse for the future. Hopefully he will step up to Gold Cup class. There's no reason not to hope he won't be a Gold Cup horse after that." said O'Neill. "A P makes all of the difference. When I knew that we had the chance of A P riding him and J P said that it was fine, I was really full of confidence, I was really thrilled. He knows the horse, knows how to ride him. The horse got a bit close to a few down the back but, if A P had asked him, he would have put him in the race too quick. Everything went according to plan, so it all worked out well. "We wanted a good gallop and A P was comfortable to lie up behind them, the horse likes a good lead and stays well. He jumped very well today. "I'd say when A P saw J P's horse in front, he thought he'd better pull his finger out! I'm glad A P has had a winner this week and I thought his ride when second on Get Me Out Of Here yesterday was the ride of the meeting. I love watching him ride - he is in pain today but he's a magic man who is in total control and always in the right place at the right time." Trainer Alan King was delighted with the performance of Uxizandre, who finished the three quarter length runner-up behind Taquin Du Seuil. The 33/1 shot, owned by J P McManus, led his rivals a merry dance for the majority of the race and looked like he had slipped the field as they turned for home. Jockey Robert Thornton still had his mount in front as they jumped the last but he couldn't quite repel the challenge of the eventual winner as they battled up the run-in. "I suppose I'm slightly surprised by his performance but we've always liked him at home and he's run a cracking race," said King. "I thought we had it turning for home but he's lost nothing in defeat and we're just happy that he's been able to show his best form here after disappointing at Warwick last time out. "He was just a bit fresh that day but we've got to be pleased with that. We'll have a chat with the owners and see how he is after this but there are options later on this season. "He has to go right-handed which rules out Punchestown but Aintree is an option, as is the Future Champions Novices' Chase up at Ayr." Double Ross finished a further one and a quarter lengths back in third and trainer Nigel Twiston-Davies was happy enough with the 11/1 shot after the race. "He's run another good race here and we're very happy with him," said the trainer. "We'll see how he is but Liverpool would have to be the plan."